An Ice-Based Observatory (IBO) consisting of an ITP and Ice Mass Balance Buoy (IMB). Attaching ITP profiler to mooring wire during deployment. Temperature and salinity are the two basic properties of sea water that all physical oceanographers want to measure. From those two key pieces of information, scientists can start to derive information about where water came from and where it is going, and what it might do when it gets to its destination (such as heating or cooling the environment). In most parts of the world, it is relatively easy to measure temperature and salinity. Over the decades, oceanographers and engineers have invented progressively more ingenious and effective ways to sample the basic water properties of temperature and salinity, from water bottles lowered from ships to moored and buoyed instruments to bobbing, automated water profilers that dive and rise from the surface to the depths. But the waters beneath the ice blanket over the Arctic Ocean—which compel scientists because they may reveal the early stages of global change—have mostly resisted efforts to be profiled. Extreme weather makes it difficult to send humans to sample the seas with any regularity; and ice cover and crushing floes have prevented researchers from leaving many instruments out in the environment…or from getting them back. If you want to make sustained measurements, researchers have realized, you have to use autonomous instruments and you have to find a way to get the data back in real time. Scientists and engineers from the Woods Hole Oceanographic Institution—led by physical oceanographer John Toole and arctic research specialist Rick Krishfield—have devised a way to do just that, and to put the ice to work for them in the process. They call it the ice-tethered profiler (ITP). ITPs are similar in concept to open-ocean moorings and buoys, though the instruments and wire are anchored to the ice instead of the seafloor. The key component is a sensor (profiler) that climbs up and down the mooring wire each day, detecting the temperature, salinity, and oxygen content at various points in the water column. Sensors are also being developed to measure chemical and biological properties of sea water. The ice tethered profiler sends data through the mooring wire to the surface buoy on the ice, which relays the data by satellite phone back to researchers in Woods Hole. That data is made available to the science community and public within hours via the Internet. The instruments, attached to Arctic Ocean’s hard surface, will slowly drift with the natural movement of the ice while observing water properties in the top 800 meters of the Arctic Ocean. 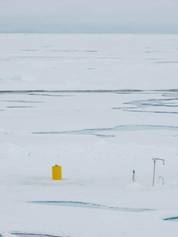 The buoys are designed to last three years, about the same lifespan as the ice floes that support them. The measurements are necessary because there is more than enough heat stored in the deep waters of the Arctic Ocean—which flow in from the Atlantic and Pacific—to quickly melt the entire ice cap. That warmer water, however, gets sequestered about 300 to 500 meters down in the ocean, beneath the “halocline,” a cold, salty layer that separates the fresher and cooler surface waters from the deep reservoir of warm water. Essentially, this halocline layer insulates the cold surface ice from the vast heat stored in the sea. Toole, Krishfield, and colleagues want to see how the Arctic water column changes from season to season and year to year and to glimpse whether the halocline is stable or changing as global climate fluctuates. Many climate models suggest that Arctic ice will melt considerably within the next 50 years, such that there is no ice cover during Northern summers. Some of the models suggest that once it starts to go, it happens very quickly, perhaps over the course of ten years. The impacts for the polar ecosystem, the regional and global climate, and for international commerce would be enormous. Physical oceanographers such as Toole and fellow WHOI scientists Mary-Louise Timmermans, Bob Pickart, and Andrey Proshutinsky are trying to understand what mechanisms might lead the ice cap to melt from below. They are not only concerned that the halocline will disappear; they postulate that warmer waters from the Pacific Ocean could enter or disrupt the halocline. Over the past three years, six WHOI ice-based observatories have been tested in the waters north of Alaska, with four ITPs currently drifting around the Beaufort Gyre. Two instruments are fully operational and sending water profiles back to shore daily. Two others are recording and sending their positions (which help scientists chart the directional flow of the ice), but not ocean profile data. One ITP shut down on schedule, taking 2,000 measurements over 17 months; the other shut down right after deployment, a victim of the engineers’ learning curve in the harsh Arctic environment. Now Toole and Krishfield are confident that they can take the ITP system to the top of the world. In April 2007, Krishfield and colleagues ventured to the North Pole to deploy ITPs at 88° North and at the North Pole. Eleven more ITP deployments are scheduled for the summer and fall of 2007 as the team works toward spreading an array of as many as 20 ITPs over the pack ice and sustaining them over time. The ITP network is one of WHOI’s contributions to the International Polar Year effort, but it is also part of a multi-year, multi-institutional program to establish a real-time, autonomous Arctic Observing Network. WHOI is working with colleagues from the Cold Regions Research and Engineering Laboratory, the U.S, Naval Postgraduate School, the University of Washington, Oregon State University, the Japan Marine Science and Technology Center; the National Oceanic and Atmospheric Administration; as well as institutions in France, Germany, Russia, and Canada. Collectively, they want to measure what is happening above, within, and below the ice. The Arctic and the entire Earth’s climate system are changing in response to the increase in carbon dioxide in the atmosphere. Ecosystems that have evolved over millions of years are going to have to adapt to a change taking place over ten years. That’s a fraction of the lifetime of one polar bear. The ITP system and the broader Arctic Observing Network will better quantify how things are changing and when they might change rapidly. It may be a little late for an “early warning” system, but any effort to better predict how the Earth will change over the next century will benefit both animals and humans. The ITP being assembled on the pack ice. Funding for this work has been provided by the National Science Foundation’s Office of Polar Programs and Oceanographic Technology and Interdisciplinary Coordination Program; by the Cecil and Ida Green Technology Development Awards; by the Woods Hole Oceanographic Institution; and by the James M. and Ruth P. Clark Initiative for Arctic Research.